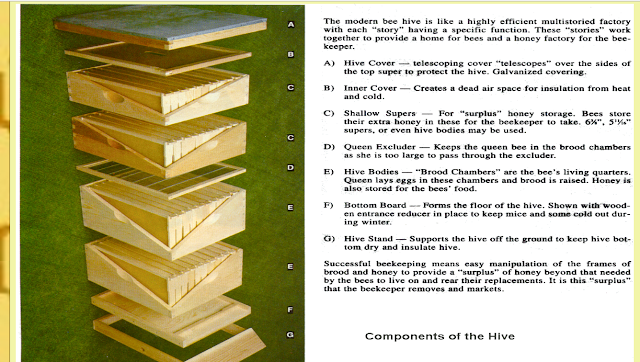 My bee setup is basically what's shown in the picture above; I don't use a hive stand - I use shipping pallets so I can pick up the hives and move them with equipment, and I haven't ever needed to use a queen excluder, but some folks do. This year has been really good for the bees. Hot weather and good blooms for most everything that they like. I started the year with 4 hives, now have 8 due to swarms, and I'm pulling the honey supers off the hives. Every hive has produced honey this year; even those that started as packages and then swarmed. The lowest producing hive was at 2 gallons of honey, the highest producing hive between 6 and 7 gallons (each!). bottle it - I've produced 17 cases of half pint and pint jars so far, and still have honey to go. The weather has been cooperative - hot and sunny (with the occasional eclipse), so opening the hives and working with the bees has been relatively easy. There's still some honey to be gathered out there, and I'm pulling the honey now by swapping empty for full. I'll pull the honey supers off of the hives when it cools down in september so that the bees have a smaller area to keep warm during the winter. Big barn - closed in! Wellhouse - closed in! 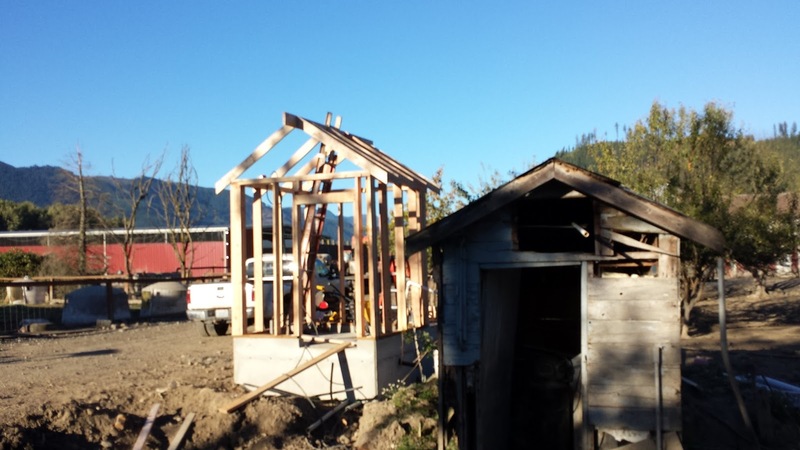 Finished two of the projects for this summer - the well house and the big barn. I framed the wellhouse with 2x6 to allow space for insulation and to be able to bury the plumbing in the walls if I chose. Most of it I left exposed for easy maintenance. 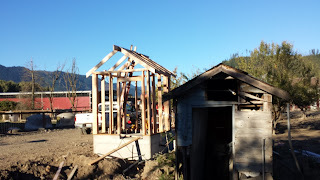 the old wellhouse is in the picture above, to the right on the bottom. The new wellhouse is about 30" above grade, the old one is built on grade. the old one floods - the new one won't. 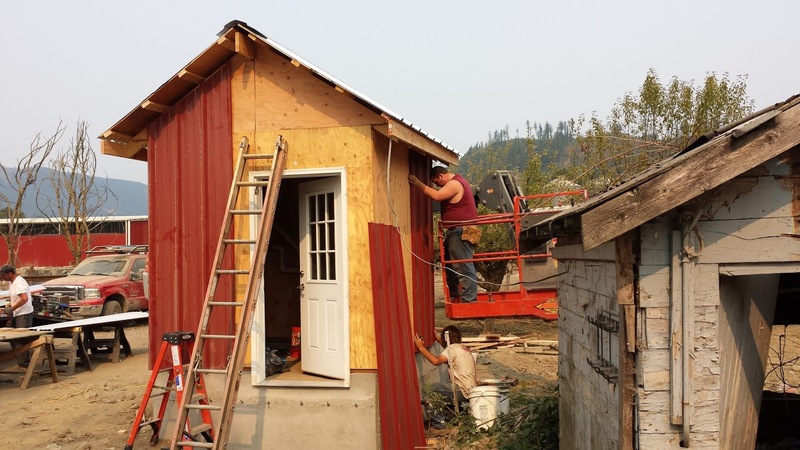 I had some sheets of siding from the big barn project - so I used that, and some trim, and picked a door that matched the existing door on the dairy office for the farm, so it has a nice consistent look with the rest of the outbuildings. It looks a little odd with the door set to the side, but that's so that I can stack pallets of salt to the left of the door. The local hardware store gives a much better price for salt when you buy a pallet at a time, and I use a fair bit of it to soften our (very hard) water. 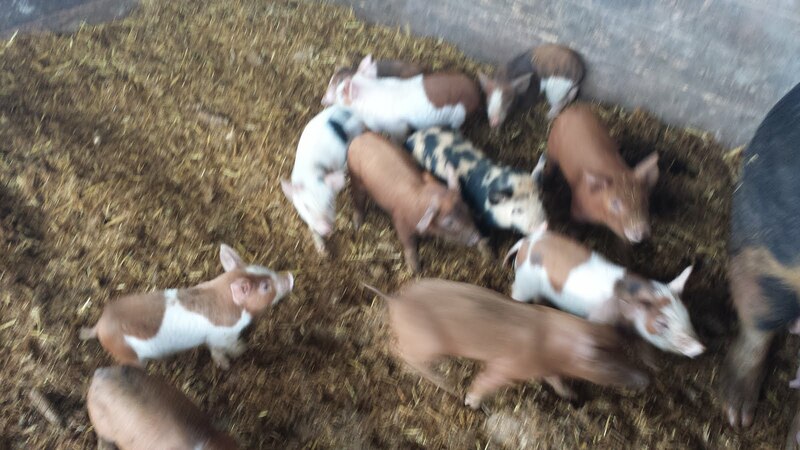 This picture was taken as we applied the last bit of skin to the barn. The top 3' of the east and west walls are clear panels, and they provide plenty of light on the inside so you don't need artificial light during daylight hours. Much more pleasant (and cheaper!) to work with. 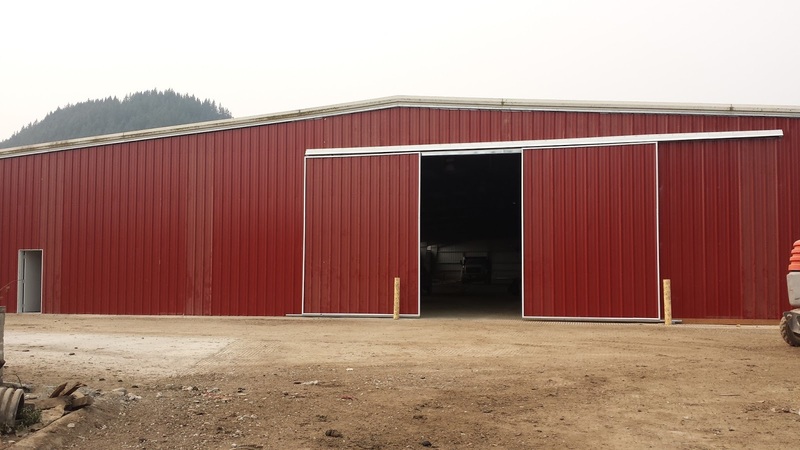 The barn itself is 250x100, and it's clear-span. No pillars or anything in the center. 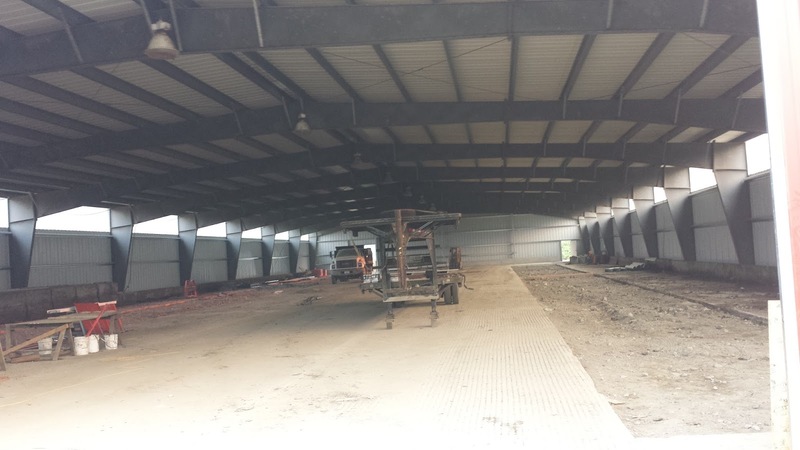 The ceiling in the center (measured from the floor to the lowest point of the structural steel, is just shy of 20'. 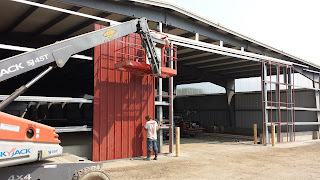 I include this picture of us attaching the barn doors and adjusting them to provide a little bit of scale. 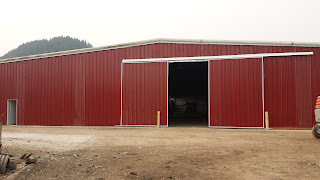 Its really hard to see how big this barn is until you put two people on top of one another, and can have a 3rd and most of a 4th and still not hit the top of the barn. I rented the manlift, and was glad I did. Would have taken much much longer to do this with ladders or scaffolding. 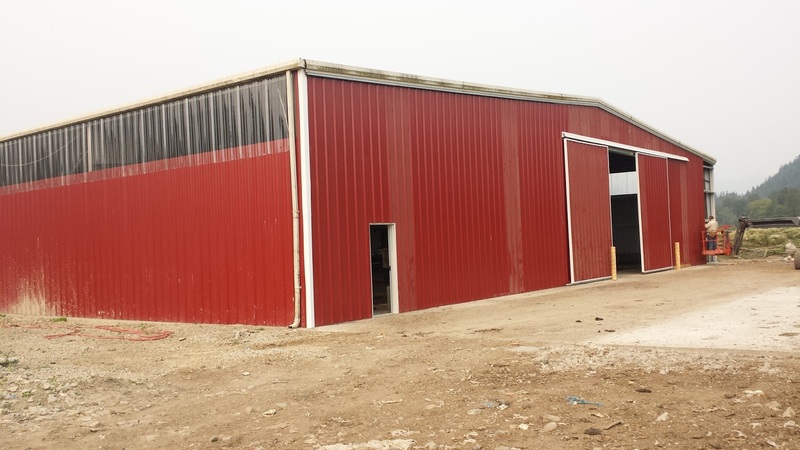 We have two strips of concrete to pour in the big barn to complete the floor, but that can now be done anytime - we have a roof and walls, and can heat the space if we need to. The well house that's served the farm is about 70 years old. And it's in pretty poor shape. 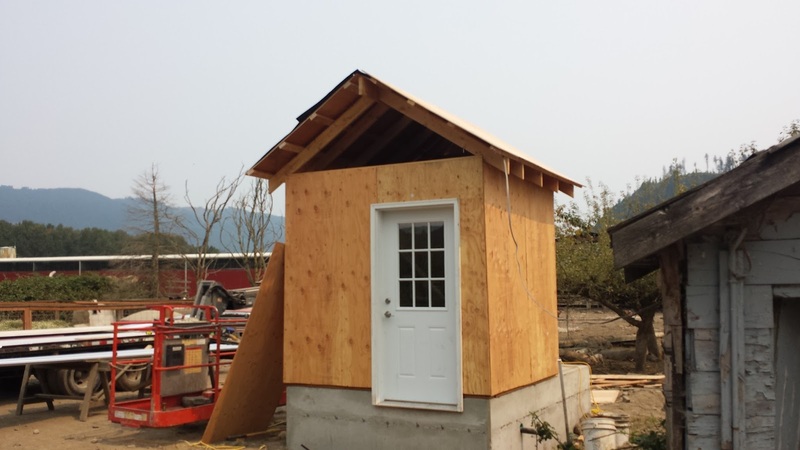 It has the added problem that it's built on grade - that is, on ground level, and it can get flood water in it. This building flooded 3 times in 2015 - a bad year, to be sure, but you really don't want important farm infrastructure to flood. The old well house is in the foreground to the right. The new one is getting framed in the background to the left. 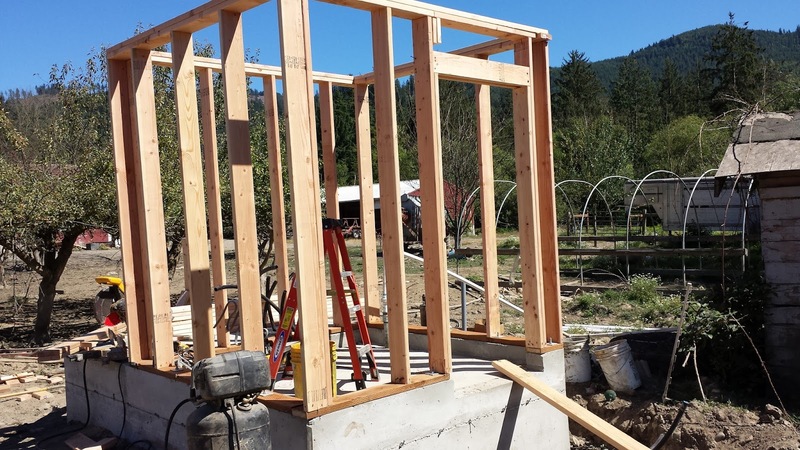 Since we had concrete trucks on site because of the big barn project I poured a foundation and walls for the well house, using the elevation of the main house as a guide. 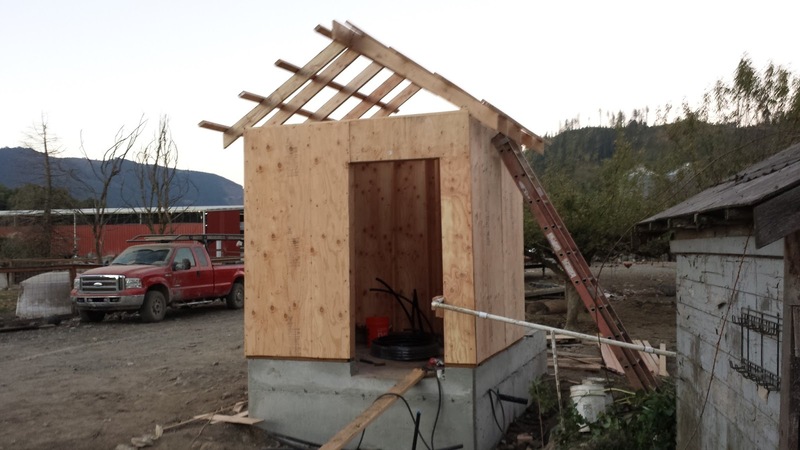 That lifted the well house about 30" above grade, which should keep the interior safe from future floods. Here the sheathing has been applied. 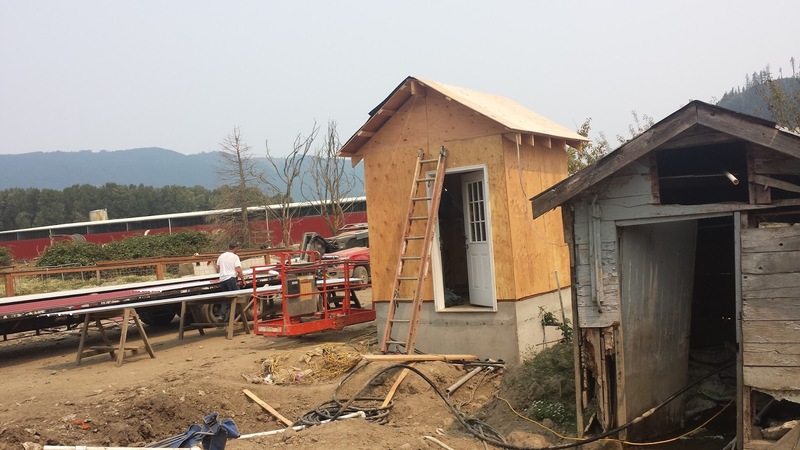 The white pipe out the doorway is the temporary plumbing. The output from the well is already in the new well house, I rigged up a temporary pipe from there to the old wellhouse until I got the whole system moved. 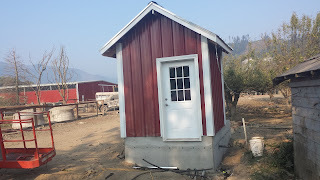 installed a water manifold with a valve for every farm area that this well house serves, so you can turn on, or off, portions of the farm water from this building without affecting other areas. Installed an anti-backflow valve, which isn't really needed here - I have an artesian well, and water flows out of it even when the pump is turned off - but it is required if I ever want to have the farm certified for food production, like cheesemaking or as a butcher shop. 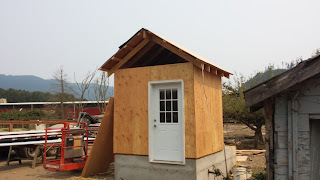 I built the new wellhouse a little larger than the old one to allow me to stock salt (used by the water treatment equipment) in the wellhouse itself. I made it large enough that I can stack a pallet of salt inside and still have room to access the valves and equipment. The local hardware store gives me a discount for buying full pallets of salt, and salt doesn't spoil (as long as you keep it dry), so I try to buy a years supply at a time. The concrete pad for the well house also serves as a base for my farms standby generator, which will sit on the side opposite the doorway shown. I think I'll have enough spare panels and metal from the big barn project to roof and side this new building with the same metal and trim, allowing me to match the overall farm building color scheme.